Who would you be if you gave yourself full permission to be, do and have all you desire? Inside all of us are dreams of greatness, but these dreams are all too often suppressed because we fear disapproval or rejection from those around us, and sadly, many of us become depressed. Could it be that we never follow our dreams, or listen to our hearts, because we are waiting for others to give us permission, and we are too afraid to give it to ourselves. If you look closely, you will see that withholding permission from yourself, or needing others to first give you permission, keeps you in a small box, and stops you from living the life you came here to live. If you look even closer, you will see that your happiness is dependent on giving yourself permission. If you don’t give yourself permission to speak up, express yourself or set boundaries, the consequence is, all too often, chronic depression. It is true that most people who are depressed generally live with harsh, self-imposed restrictions, and, simply do not give themselves permission to be who they want to be, or do what they want to do. Giving yourself permission to live the way you want to live should be the most natural thing in the world, so why is it actually one of the most challenging? It is fairly easy to see that we are systematically programmed to “ask permission.” Traditional education is a system of disempowerment, where children are programmed to give their power to those in authority, often with painful consequences fordoing something without permission, including shame and ridicule that may last a lifetime. From the first day of elementary school, we were taught that permission is required for everything that we do, even for basic personal needs. When children’s self-worth is attached to their ability to receive permission, they may compromise and sacrifice themselves in order to receive permission from those in authority, further leading to disempowerment. Consider that child sexual abuse may be so prevalent because children are taught that they are powerless; they need permission in order to speak, go to the bathroom and set personal boundaries, so, when an adult does something that seems inappropriate, children don’t know that they have permission to say no, and protect themselves. Children, who must ask for permission, grow up to be adults who also need permission. This, of course, supports a militant society, where everyone is expected to follow along and do what they are told. The cost is the suppression of personal growth, development and self-expression. Every time we must seek external permission, we give our power away, and every time we give our power away, the box, in which we live, gets smaller. When we are programmed to ask permission, we are systematically programmed for disempowerment, which is the primary cause of depression, anxiety and countless social disorders. In a world where we are conditioned to need permission, we automatically seek approval from family, friends and others, and because we fear disapproval, we suppress our true selves, hiding any dreams and desires, of which, others might not approve. We often make ourselves small as we conform to familial, cultural and societal norms, so that we don’t risk judgment or rejection, and, as a result, we each create a limited bubble of permission for ourselves, and this becomes our comfort zone. Rarely, do we hear with our ears, “You are not allowed,” but you know when you are being judged, and you know when others are withholding love, acceptance or approval because they don’t like your behavior or your new ideas. When you are met with statements like, “It’s your life, I hope you know what you are doing,” there is no doubt that approval is withheld. They might as well stamp big, red letters on your forehead, “DENIED” – leaving you feeling unworthy and powerless, and making you believe that you must prove, more than ever, that you are worthy of approval. Have you ever left a conversation, or even a relationship, thinking, “I’ll show them!”? But, it doesn’t have to be this way. You don’t have to “show” anyone, anything, to prove that you are worthy, and you don’t have to rebel against those who don’t give you permission; you just need to stop looking for permission, and you need to give it to yourself full heartedly. Giving Yourself Permission to Be! Who would you be if you gave yourself full permission to be, do and have all you desire? Most of us are so accustomed to withholding permission from ourselves, and seeking it from others, that we don’t even know that we are doing it, and, so, it invisibly runs our lives. We are trained to look outside ourselves for permission, but this is part of the illusion, because the only one who can give you permission to be yourself is you. What might it look like to give yourself permission? Express yourself, speak your truth, and say what no one else is saying? Follow a radical dream, be different, and do what no one else is doing? Dress the way you want to dress, not follow along, and live where you want to live? Create and share your gifts – sing, dance, write or build something amazing? Love who you want to love, despite culture, religion and family expectations? If you’re just not sure how to go about giving yourself permission, or what to give yourself permission for, consider giving yourself permission to embark on an inner journey – to discover who you really are, and consciously choose who you want to be. Following your dreams and your heart’s desires requires giving yourself permission to express yourself and finding the courage to create something that inevitably expands your comfort zone, but, it also means giving yourself permission to say no. Just as we are afraid to give ourselves permission to do, be or have what we really desire, we also withhold permission to say no to what we do not desire. It is said that we are spiritual beings having a human experience, but everywhere you look, you can see that humanity is addicted to “doing,” with personal worth dependent on the amount and quality of our doing. Because we are programmed to believe that we are unworthy, unless we prove that we are worthy, we must keep proving it over and over. As soon as we stop “doing” whatever it is that we think we are supposed to do in order to prove worthiness, we instantly feel unworthy. When your worth is attached to doing, it is very difficult to give yourself permission “not to do,” but giving yourself permission “not to do” is exactly what you must do in order to free yourself. So, how do you give yourself permission to live your life like you really want to live it? Firstly, giving yourself permission does not mean that you abandon your responsibilities and commitments and you start over somewhere else, nor, does it require changing your whole life overnight. More often than not, giving yourself permission is a gradual process, so, don’t underestimate the big difference, even small steps can make. Let Go of Approval: As long as you need the approval or acceptance of others, you will find yourself entangled in a messy web of needing permission. This means that as you stop seeking external approval or acceptance, your ability to give yourself permission to do, be or have what you desire will expand exponentially. Stop Judging: Entangled with the need for permission is self-judgment. The more we seek external permission from others, the more we judge ourselves. When you give yourself permission to try something new, it is important to give yourself the space to make mistakes without self-judgment. Keep in mind, perfectionism is just a sneaky name for self-judgment. Disentangle Your Worth: Instead of gaining a sense of artificial and conditional worth from what you do, make your worth independent of everything and everyone. It helps to have a practice of meditation for the purpose of connecting with the higher part of you who knows your unconditional worth. Learn to Trust Yourself: Intertwined with permission is self-trust. In order to give yourself permission, you must trust yourself to make conscious choices. If you don’t trust yourself, how can you ever give yourself permission? There is an all-knowing consciousness inside you, at all moments, guiding you for your highest good. The more you can connect with this guidance, and the more you listen to it, the easier it will be to give yourself permission. For more on Self-Trust, please read my article Trust Yourself – You Already Have All The Answers! Permission for Self-Care: Do the needs of others come first, and the only time you really give yourself is the time left over, after you finish doing everything, for everyone else? We all know that “left over time” rarely, if ever exists. We get up the next day, and the cycle continues, at least until we burn out, or get sick, and we are forced to turn our attention on ourselves – only in these extreme cases, we give ourselves permission for self-care. But, it doesn’t have to be this way. You don’t need to unconsciously create illness or burnout as an excuse to take care of yourself. You can remedy this dysfunction by giving yourself permission to prioritize self-care. Replace Obligation with Choice: The more you give yourself permission to make choices on your own terms, according to your own desires, the more you will see that you have more choices than you know, and you are a great deal freer than you believe. When the things you do come from choice opposed to obligation, a tremendous energy is freed up, and you suddenly have the capacity for so much more than you ever imagined possible. Practice Permission: At first, it might feel quite uncomfortable to give yourself permission, but the more you practice, the easier it will be. Make a list of everything that you would do if you gave yourself permission, and begin to check things off. Maybe even do this with a supportive friend or two. Oftentimes, we don’t realize that the biggest obstacle between us and a better, healthier and more abundant life is the fact that we have not given ourselves permission. Really think about this…. If you are sick, give yourself permission to heal. If you are poor, give yourself permission to be abundant. If you need help, give yourself permission to ask for help. If you are trapped in an unhappy job or relationship, give yourself permission to be free. Keep in mind, the opposite of depressed is empowered, but, in order to be empowered, you must give yourself permission to Be Empowered. In order to truly give yourself permission to do, be or have what you desire, you must back it up with self-responsibility. As you stop looking to others for permission, you must also stop shifting responsibility. You can’t give yourself permission and then expect someone else to be responsible for the choices you make, or the experiences you encounter. Any way you look at it, it’s a package deal; the more permission you give yourself, the more responsibility you must accept. This is the core of self-empowerment and a pivotal key to overcoming depression. Growing up, my wise dad frequently told me, “You can be, do or experience anything you want, as long as it doesn’t hurt anyone.” You might say that my dad gave me permission to be myself, but, in the end, it was really me who gave myself permission, because it can be no other way. I am hoping that this article does for you, what my dad did for me. The way to become empowered is to empower yourself, and it all begins with self-permission. This article is an excerpt from the book ‘Escape the Matrix of Depression’ by Nanice Ellis. We are not meant to be depressed, yet millions of people worldwide suffer, from mild to chronic, depression, and don’t know why. 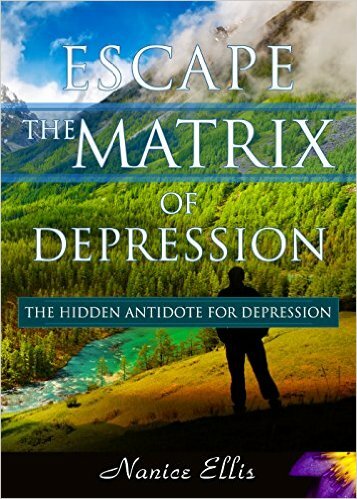 Escape the Matrix of Depression will help you to understand the core reasons why a pandemic of depression darkens the world, and how you can free yourself. 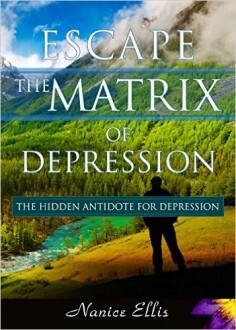 ‘Escape The Matrix of Depression’ is available on Amazon.